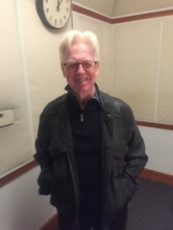 Larry Kirwan, creator of the new musical “Paradise Square” at Berkeley Rep, the author of five books, and the lead vocalist and guitarist for the legendary New York Irish American band Black 47, in conversation with host Richard Wolinsky. Larry Kirwin’s five books are Green Suede Shoes, a memoir subtitled An irish American Odyssey; A History of Irish Music; Rockin’ the Bronx; Mad Angels, a colleciton of plays; and a novel based on his play, Liverpool Fantasy. He’s written several plays, many of which were produced in New York, off and off-off Broadway. His band, Black 47 produced albums and went on tour over a 25-year period from 1989 to 2014, along the way making a name for itself through its music and politics.